Welcome to Tasmania and the friendly town of Launceston! You will be met on arrival at Launceston airport and transferred to your hotel. The rest of the day is at leisure for you to explore this beautiful city. Your hotel is located in the heart of the city with easy access to shopping and local restaurants. Tonight, enjoy a welcome dinner at your hotel with your Tour Director and fellow travellers. This morning, ascend into the lunar landscape of the old copper mining centre of Queenstown and discover its history. View ‘The Wall in the Wilderness’, an artwork in progress, 100 hand carved Huon pine panels depicting the history of Tasmanian life are being created by sculptor Greg Duncan. 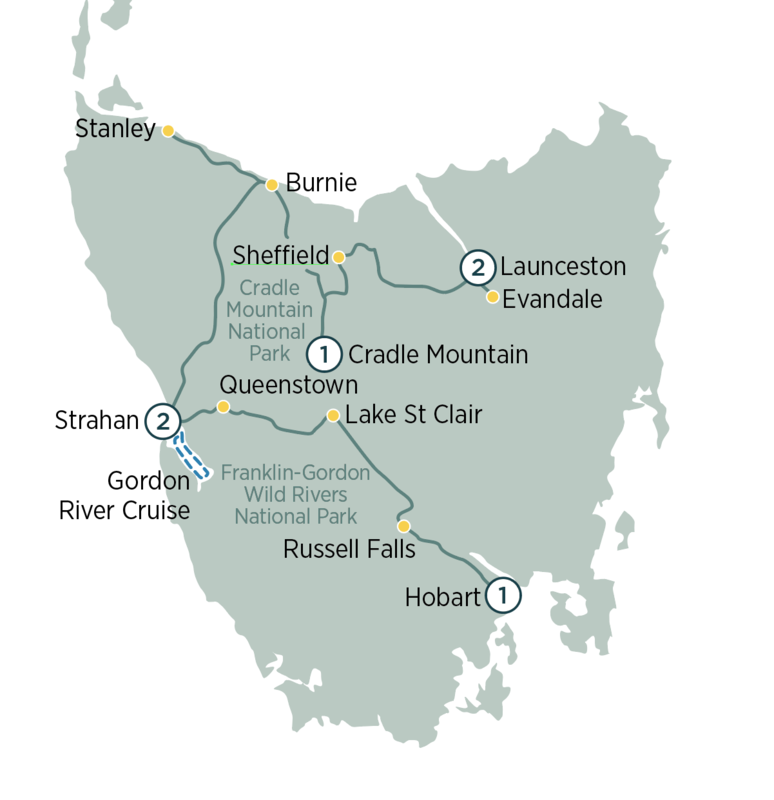 Travel to Lake St Clair, Australia’s deepest natural freshwater lake. Continue on to Mt Field National Park, one of Tasmania’s oldest and most popular National Parks, and take a short stroll to stunning Russell Falls which rise 100 metres over a series of cascades. This evening, enjoy your farewell dinner and recall fond memories of your Tasmanian holiday with your fellow travellers. This morning, stroll through Salamanca Place and explore the colourful stalls of bustling Salamanca Markets, one of the nation’s most popular markets. Some of the state’s finest arts, crafts and produce can be found here. Your tour concludes with a transfer to Hobart airport. Please book flights after 2pm. Enjoy a sumptuous buffet lunch on the Gordon River Cruise through pristine wilderness.